Here at Clachaig Inn and Clachaig Holidays we increasingly recognise the need to operate our business so as to minimise our impact on the environment and to operate in a sustainable manner wherever possible. In addition, we recognise our corporate responsibilities as a business trading within a rural community. Adopting such a policy has involved taking small steps towards our objectives and we’ve set out some of our achievements to date below. However, we recognise that we can still achieve more, and we keep our policies under constant review. Over the last 2 decades Clachaig has participated in the Green Tourism Business Award, operated in conjunction with VisitScotland. In recent years Clachaig was acheiving the Silver Award. In 2017 a decision was taken to withdraw from the scheme due to increasing cost versus additionality issues. However, Clachaig has maintained a commitment to continue working within the framework established over the long history of the programme. Champion locally produced cask conditioned ales – a “real” product, produced in Scotland, and generally within the Highlands and Islands area. Our regular festivals can feature as many as 40 different varieties within a week and our range always features a wide variety. Champion Scottish malt whisky and Scottish distilled gins – again, “real” products having a distinct Scottish identity. Clachaig stocks as many as 350 varieties of whisky on the ‘top shelf’ and as many as 60 gins at the last count. Use locally (from within Scotland) sourced meat and fish products in our menus, in as far as practical, considering cost and supply issues . Some produce, such as venison is generally supplied from the Lochaber hills. Operate a clear smoking policy, which bans smoking in all guest bedrooms (and all public areas by law). Active management policy seeking minimal environmental impact, low waste, sustainability on all management decisions after giving due regard to cost and supply issues. Effective staff induction and on going training via Key Skills documents contain reference to Environmental Impact Policy and Sustainability issues. Adopt ‘Best Practice’ management styles. Programmes have limited lifespans, particularly when ‘new learning’ is compare to cost. However, in recent years, we have twice been successfuly assessed against the Investors In People Standard, and were proud to be be the first business in Lochaber to be recognised as meeting the Hospitality Assured criteria for excellence in service and business excellence in 2007. Bottles, other suitable glass and other recyclable products are collected and taken away for re-cycling (for a fee) by a commercial contractor. Waste cooking oil is collected and taken away for re-cycling (for a fee) by a commercial contractor. Re-cycle paper and cardboard is collected and taken away for recycling by a commercial contractor. Organise Litter Picks. 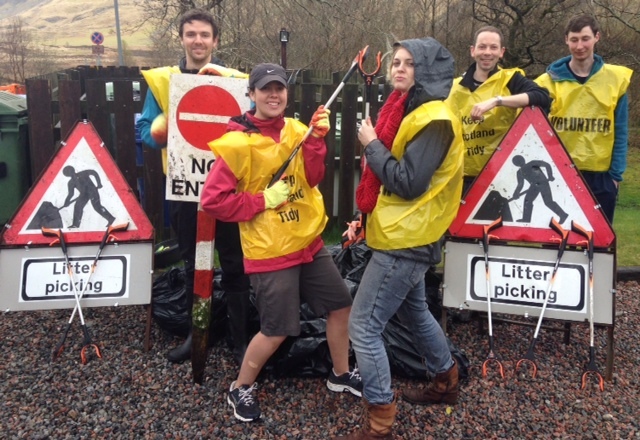 At least once per year, team up with neighbouring local businesses, including Glencoe Independent Hostel, Strath Lodge and Heatherlea B&B to collect litter along the road between the A82 junction and the bridge into the village. Welcome walkers and cyclists by participating in the Walkers Welcome and Cyclists Welcome schemes operated by VisitScotland. Provide guest information and sources of further information regarding access to visitor information, walks and mountain access etc. Specifically, room information packs (containing suggestions on walks and visitor attractions), up to date brochures on the local area in the brochure rack and further paid offerings such as detailed maps and guidebooks. Customer feedback solicited to gather views of all our customers. Regular review and if necessary, act upon the feedback. Closer reference to activities within the glen and the local area through partnership working with community groups and other key providers such as the NTS. Communicate Environmental Impact Policy to customers. Actively seek to raise funds for a variety of locally based charity/projects based on a pre-set criteria. Operate a rolling programme of £1000 targets. Annually present the Winter Experience Lecture Series annually, on a free entry basis, in association with the Mountaineering Council of Scotland to promote mountain safety to as wide an audience as possible. Recognise the mountaineering heritage of the area through the promotion of mountain and outdoor adventure sports lectures. Reserve “bar top” fund raising for Glencoe Mountain Rescue collection boxes. In 2013 the total handed over to GMRT was £1785.32, with a further £1894 raised through the Big Winter Raffle. Further sums have been raised in subsequent years. Draw water from a sustainable private supply, using UV filtering and no chemical treatments. Operate our own bio-disc sewage treatment plant where final effluent complies with strict SEPA controlled standards.